Feral cats need more than neutering. Because they have been neutered, they are living longer and are encountering some of the illnesses and injuries – without help these would have killed them previously. They have caretakers that care about them yet have limited funds. Feral Fixers attempts to assist the caretakers in keeping their ferals healthy and helps do the necessary testing and health care that enables some of these ferals to live out their days outside or inside if they choose to make that change. The total bill for June, 2015 was $3,331.57. The caretakers often ask what the services cost and donate to cover if they can, but many can’t and sometimes these cats do not have caretakers at all. If an injured cat appears with no history, do we turn him away? No, we give him a chance and if he needs to be euthanized, we make sure that happens without fear and pain. Our costs for limb and eye removal are very reasonable due to the generosity of our vets, but still a major expense in the total. Our goal is a minimum of $3,000 to be raised between August 15th and October 16th, which is also National Feral Cat Day! Donate thru PayPal (just click on the Please Help! - As If They Were Our Own logo, on the left), by mail or in person at one of our many events and help us care for the cats, worry free, for at least a month’s time! Timmy is the sweetest, most lively kitten – and we’ve seen many! We got a call from a caretaker on June 22, the emergency vet wanted $5,000 to treat a kitten with a broken leg, they could not afford it, could we help? 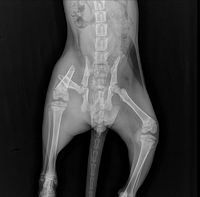 Emergency vets are very expensive and we already knew what a leg amputation usually costs at our vet – okay. 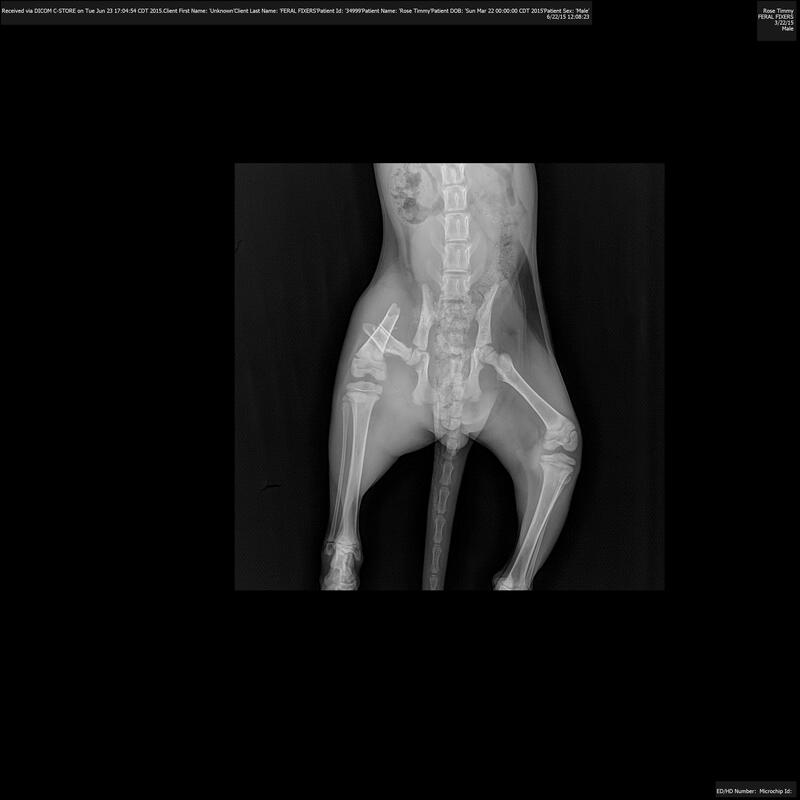 The femur bones had a very clean break and should have a very good outcome with surgery. The broken bones in the pelvis would have to heal on their own but it didn’t look like there would be a problem with that. Surgery took place on June 23rd. Timmy yelled from the get-go, demanding attention and holding. He had a huge, blue cast on his rear left leg and he was not happy about it. I had never seen a cat do repetitive forward rolls to move themselves around – seriously, he would put his head down and throw his body over after. Ten days after the surgery, after his bandage change and re-wrap, the rod that had been placed to hold everything together began working its way out. Back he went to the clinic for severely restricted movement, some sedation. Second day there, he managed to get the rod out entirely on his own – laying next to him when he was checked on in the morning by clinic staff. The rod could not be replaced due to risk of infection, another surgery was out of the question, we would wait and see how well the bone formed without the rod. He went to foster and was still very mad about that cast, only happy if he could be held and it was impossible to keep him quiet unless he was being held. Unfortunately, bone did form on the ends of the break but they were still nowhere near each other, did not connect. On July 31st, Timmy’s leg was amputated, he spent several more days at the clinic for recovery, but now is much happier without that useless leg weighing him down! He’s still confined at foster. Still yelling if he is not getting attention. But a happier cat that will be able to get around just fine on those three legs!!! These written words cannot convey all the effort that went into trying to help Timmy keep that leg – one of the staff at the clinic bought him a special memory foam bed – he was severely spoiled while there – hmmm, have anything to do with the yelling? We cannot wait til he is ready for adoption, he is sure to make his new family very happy! Some wonderful people went to work and they found Shamrock’s original adopter. He had been based in the Chicago area almost three years before and had someone caring for Shamrock – who he had named Mimi – and the cat was lost. He now lived in Los Angeles but would be visiting Chicago in the near future and hoped to take Shamrock/Mimi back to LA. Despite this hope, there were delays, during which time Shamrock began losing weight, hoping it was because of his bad teeth, he got a dental and a blood panel – he had a thyroid condition but was otherwise doing well. We began treating his thyroid and improved, we then got him vaccinated so that he could make the trip cross-country – airlines require a current health certification on animals. Shamrock began to loose weight. Thyroid conditions often mask many other ailments that might be present. We re-did blood tests and many things were out of balance now. His kidneys were not keeping up and the decision was made to euthanize him. His person was in China and out of communication with us but it was very important that Shamrock not suffer any longer. We have spoken with his person since and he is very thankful for everything we did for his Mimi. Feral Fixers has the opportunity to interact with so many people and cats, hoping to help in any way we can and we thank all of the people who played a part in Shamrock/Mimi/Guy’s life, from the shelter who first cared for him, his adopter who loved him and did his best, the rescuer who brought him in and did his best, the resourceful people who tracked down his adopter, our foster and the vet staff who did everything they could for him and for you, our public, our donors, our support, who make stories like these possible. This is not a sad story, it is a story of one cat’s life and all the people who wanted the best for him. At the recent Prairie States Conference in Bloomington, IL, Dr. Kate Hurley spoke about the new Million Cat Challenge which hopes to save cat’s lives thru the use of TNR, managed intake, remove adoption barriers, reduce surrender rates (thru medical or food assistance) – a cat that does not enter an animal control is a “saved” cat. 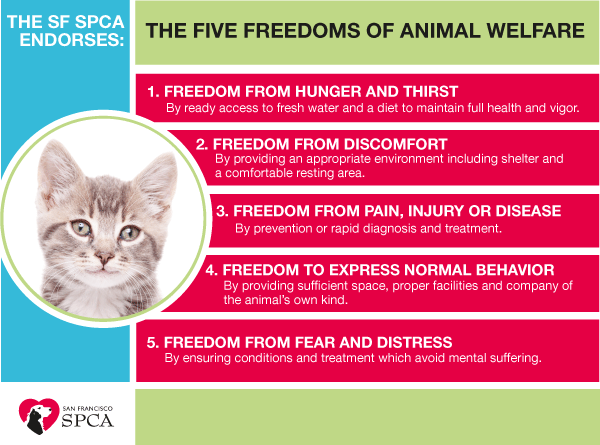 One of the factors is called “Return To Field” which is more than TNR. Return To Field reduces the number of feral and stray cats turned into animal control – if someone brings a cat that they have trapped to AC, they must pay a fee to leave it there to be most likely ultimately euthanized OR give permission to allow the cat to be TNR’d and returned to their neighborhood for free. A TNR organization coordinates the spay/neuter and return of the cats to their previous location. Donated funds are allocated to pay for this program, reducing the impact on the animal control shelter. Return To Field means all cats, including friendly strays. When asked about “friendlies”, Dr. Hurley replied, “What about them?” That seemed to be the consensus among the animal control representatives at the conference. The goal is to keep the cats out of the facility, whether those cats would do well in a home or not. Please take a look at the Million Cat Challenge – there are some great ideas there and some that need a second look, but it is very educational! There has been a shift in the Animal Control world, the goal is not to euthanize their way out of the cat problem any longer, a good thing!